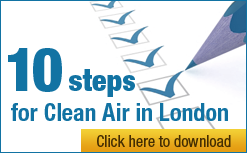 “The Campaign for Clean Air in London is pleased that the government is continuing its earlier practise of issuing summer smog alerts when air quality is poor. “CCAL wrote to Lord Hunt earlier this year after no alert was issued during a worse still summer smog which occurred during the G20 meetings in London in April. “In that letter CCAL urged the government to continue issuing smog alerts when necessary and to update its alert bandings. The current Air Pollution Bandings and Index (API) system was developed by the Committee on Medical Effects of Air Pollutants (COMEAP) in 1998 and reviewed in 1999/2000. In CCAL’s view, the API is hopelessly out-of-date since air pollution can remain in the Low band all year but still breach legal standards for dangerous airborne particles (in force since January 2005) and nitrogen dioxide (in force from January 2010). This is a very confusing message for the public. * These figures should be updated to take account of the latest medical advice from the European Environment Agency.